The Vickers Hardness Testing Machine we supply is fabricated in strict conformity to 15:1754-196. The Vickers Hardness Testing Machine is made using superlative quality materials to ensure safety and durability of the products. This range of Vickers Hardness Testing Machine also undergoes stringent quality control tests to make them free from all drawbacks. 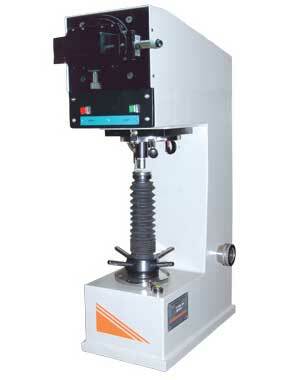 We manufacture and supply Vickers Hardness Testing Machine at market leading prices. The load on the machine is removed mechanically after a specific lapse of time. To accommodate the high precision loading system & an optical projection screen, the machine frame is designed sturdy. Specimen is placed on a testing table. The test cycle is fully automatic. The accurate load is applied on a diamond penetrator by means of a lever & weights. The load is removed automatically after a specific lapse of time. The objective is indexed with the test piece & the diamond indentation is projected on the measuring screen. The diagonals of the indentation can be measured by means of the micrometer screw of the projection screen.